This Wedding Event Photo Folder is perfect for sending each guest a photo keepsake of the wedding inside a photo folder. Cardboard photo folder is designed to be used as is, or personalized with custom imprinting. 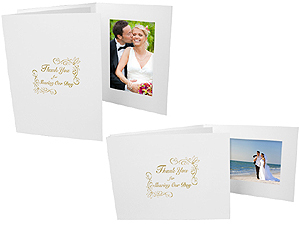 We use our standard white photo event folder and then accented with the words "Thank You for Sharing Our Day" inside a design in gold foil. The design is hot stamped (imprinted) right onto the front of the folder.